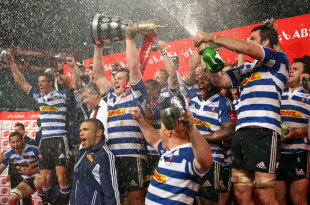 Western Province ended an 11-year Currie Cup drought with a 25-18 upset victory over Natal Sharks in the title decider at King's Park in Durban on Saturday. The visitors notched the only try of the game with centre Juan de Jongh's score just before half time proving the decisive moment in an entertaining contest. Fly-half Demetri Catrakilis weighed in with 17 points with the boot to steer Western Province to the South African crown for the first time since their victory over the Sharks in 2001. Catrakilis opened the scoring before the Sharks took control with four penalties from fly-half Patrick Lambie. Replacement Joe Pietersen reduced the arrears with a long-range penalty before De Jongh pounced for his try. The Springboks international cut an inside line off a Catrakilis pass and beat three defenders to score under the posts. Catrakilis slotted the extras and added later added a second penalty to give Western Province a 16-12 lead at half-time. The Sharks rallied after the break with Lambie slotting one penalty to close the gap and then another to edge his side ahead once more. But back came Western Province with an outstanding display from lock Eben Etzebeth helping to lay the foundation for a battling comeback that saw Catrakilis kick two more penalties and a drop goal to keep his side out of reach and on course for a famous win.